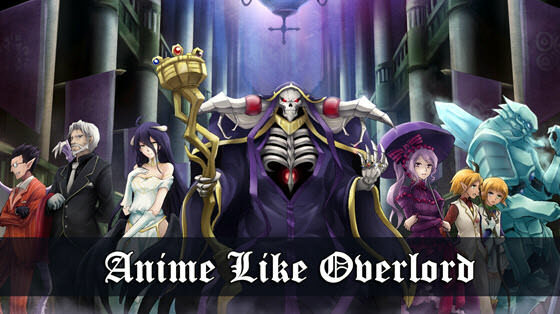 21 Anime Like Overlord (Series) '+g+"
Are you a fan of the Overlord anime series and with the end of the third season you want to watch more similar anime with over power hero set in a virtual game's fantasy world? Don't worry we bring you a list of anime with similar premise. Most of the below anime's share one or more qualities of Overlord series such as overpowered hero, fantasy world, Isekai theme, RPG mechanics, have superpowers/magic, etc. If you feel that there is any anime similar to Overlord that we might have missed please make sure to mention them in the comments below so that we may update our list. Log Horizon is an fantasy Isekai anime about a popular MMORPG game named Elder Tale. One day the players gets struck in the game and unable to log out of the game they have to now adapt to the game universe. The anime follows Shiroe who teams up with friends and forms a guild called Log Horizon and tries to survive the harsh game world. Both Overlord and Log Horizon has a lot of similarities such as the main characters of both anime are very Powerful, Intelligent, experts in using in game skills, leaders of the guild and both build a nation/city. No Game No Life is an anime that follows the legendary gamer duo named Shiro and Sora who are known together as "Blank" in the game world. They both are teleported to the magical world of Disboard by Tet "the God of Games". In this world all the conflicts are resolved through games and our duo are tasked restore humanity’s honor, unite 16 races of the world and defeat Tet. Sword Art online is a VMMORPG game where the players can have an immersive virtual reality gaming experience by using a special helmet like gaming gear called NerveGear. On the launch of the game about 10,000 players discover that they cannot logout of the game and finds that the only way of escaping the game is to beat the boss at 100 level tower. Kirito the strongest lone wolf player along with his friends and other guilds tries to beat the game before its too late. Just like how Momonga is the strongest player in Overlord, Kirito is the strongest player in Sword Art online. Also check out this list of recommendations for more anime like Sword Art Online. 4. Dungeon ni Deai wo Motomeru no wa Machigatteiru Darou ka? Also known as DanMachi: Is It Wrong to Try to Pick Up Girls in a Dungeon?. The anime is set in the world of Orario which possesses a large Dungeon filled with treasures attracting a lot of adventurers. The story follows a young adventurer named Bell Cranel and a lonely goddess Hestia both hoping to reach their goals. One day in the modern city of Tokya a dimensional gate opens up in Ginza district, and all sorts of dangerous creatures starts pouring out of it and starts invading the surrindings. The Japan forms a Self Defense Force (JSDF) and sends all the creatures back to their world. After 3 months the JSDF are sent to the world beyong the Gate to learn more about it and initiate peace negotiations with their empire. Both the Anime Overlord and Gate have strong focus on the politcs and diplomacy however Gate is a light hearted anime with less battles when compared to Overlord. Youjo Senki AKA Saga of Tanya the Evil follows the story of an arrogant Japanese man who has been reborn as Tanya Degurechaff a 9-year-old soldier girl after insulting Being X a self proclaimed god. The anime is like Overlord except it is set in World War 1 of an alternate universe where magic exist. The main characters both Youjo Senki and Overlord are trapped in another universe possessing amazing powers and intelligence. Tensei shitara Slime Datta Ken AKA "That Time I Got Reincarnated as a Slime", follows the story of an 37-year-old human Satoru Mikami who is reborn as an Slime monster in an alrternate fantasy universe after being killed by accident. Don't let the slime's cute harmless appearance fool you, it is a powerful wizard with many unique and powerful abilities. There are many similarities between both the anime's such as the both main characters are in their 30's in real life, not so social and very powerful. The only difference is that Overlord is a bit dark themed when compared to Tensei shitara Slime Datta Ken which is on a lighter note. 16. The Devil Is A Part-Timer!